This very interesting name is medieval and is of Salvonic origins from the Middle European Area of Hungary and Czechoslovakia. The meaning is similar to the English "Ange" which is to say that it is a descriptive nickname surname for somebody who acted the part of an Angel in the popular travelling theatres or the local Pageants, or it was a Baptisimal name of endearment. 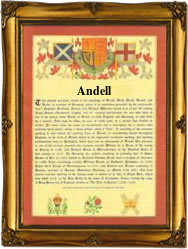 The name appears in 16th Century Germany as "Andiel", and this may well be the origin of the English name holder. Thomas Angell was one of the early American settlers who arrived in Boston in 1631. The first recorded spelling of the family name is shown to be that of Wilhelm Andiel. which was dated c. 1680, Ronow, Germany. during the reign of Emperor Leopold I, of the Holy Roman Empire, 1668 - 1705. Surnames became necessary when governments introduced personal taxation. In England this was known as Poll Tax. Throughout the centuries, surnames in every country have continued to "develop" often leading to astonishing variants of the original spelling.